So said William Shakespeare’s in his play “As You Like It.” This quote is often said but is taken out of context and doesn't mean what you think it means. Many believe Shakespeare is explaining that we are all predestined to lead the life we do. Yet read in context with the rest of the play, we see that Shakespeare was actually speaking in satire, mocking the stoic and traditional view of life that we are born into station, status, and destiny, and cannot change our 'Birthright'. He introduced 7 stages of life from birth and infancy to aged infancy and death. The Stage referred to is life itself, actually divided into 7 acts of life, conception to death. “All the men and women merely players” does not mean that we are following a script co-authored by Destiny and Fate. He is saying that all who live were born, will live, and will die. Through satire he is encouraging us to release the bonds of society; to grab the pen and write our own life’s story. Our personal play is a work in progress, written by each of us. If we don’t like how the story is playing out, we can simply rewrite the present, our perspectives of the past, and our plans for the future. Recently I watched an episode of ‘Super Why?’ with my grandson - I learn a lot from these ‘kids’ shows’ - the program included the nursery rhyme about Miss Muffet, but from the Spider’s Perspective. This story always makes Spidey sad, he didn't mean to frighten Miss Muffet, he wants to be friends with everyone, not scare them. But what could he do? Why not simply change how the story is written? Let’s first remove “frightened” - but replace it with what? Would Miss Muffet be Spidey’s friend if he barked? Probably not, but what if he Smiles and invites her to play? Small change maybe, but look at the results: From Fear to Fun, from Sad to Glad. So even though Life may be a stage, each of us may write our own script, or we can adlib. 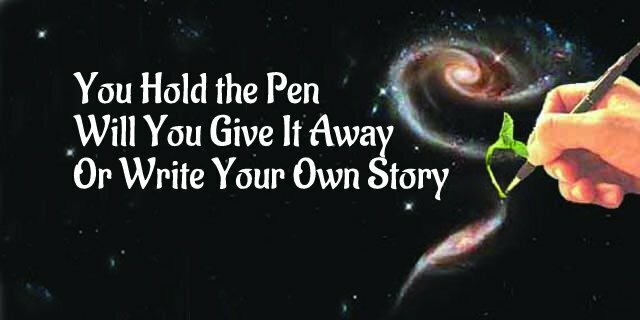 I will write mine in a dynamic way, always flowing with change, harmony, and happiness. How about You, How will you write your story?